Rather than keep adding to an article many appear to have read (over 1000 in 18 hours!) 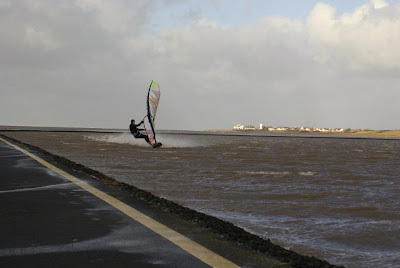 I want to add more about the top speedsurfer of the day at West Kirby on the 7th of December 2011. 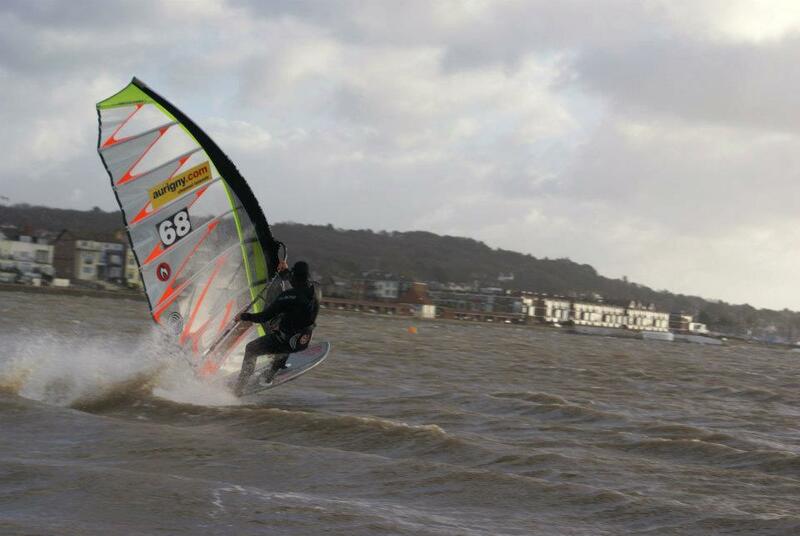 The first thing I have to say is I think the new Hot Sails Maui slalom/speed range looks fantastic and the photo to the left you can really see how effectively it twists off. This may be helped with the fact that the wind was gusting to around 50knots and the man/mountain pinning the sail down is 6'7" (2 metres for those who use the proper modern way of measurement!) and nearly 120kg. This is a huge advantage in these conditions, giving the sheer power and leverage to pin down a bigger sail, and hold the whole set up through less flat water along the length of the course (At least thats my experience following Pete Young around Portland Harbour). The other element Martyn brings is incredible skill, with a lot of top 10 places through the 90's he made a comeback in 2008/09. 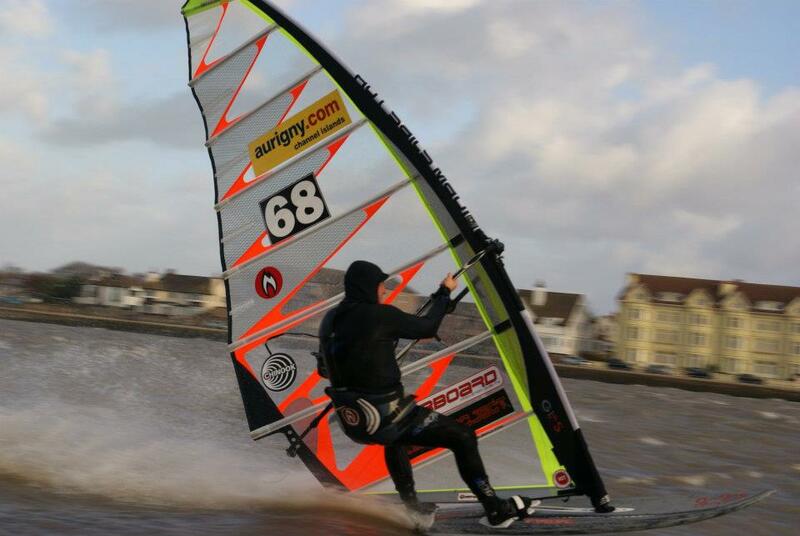 He took the second place for this years European Speed Championships, along with second for the UKWA Speed Trophy. I know he watches West Kirby forecasts very closely, for him it is not a simple (long) drive as he is a resident of Guernsey. He has to plan his quiver choices before he leaves home unlike most of us who just load as much as we can into a van and just sacrifice sleeping area. 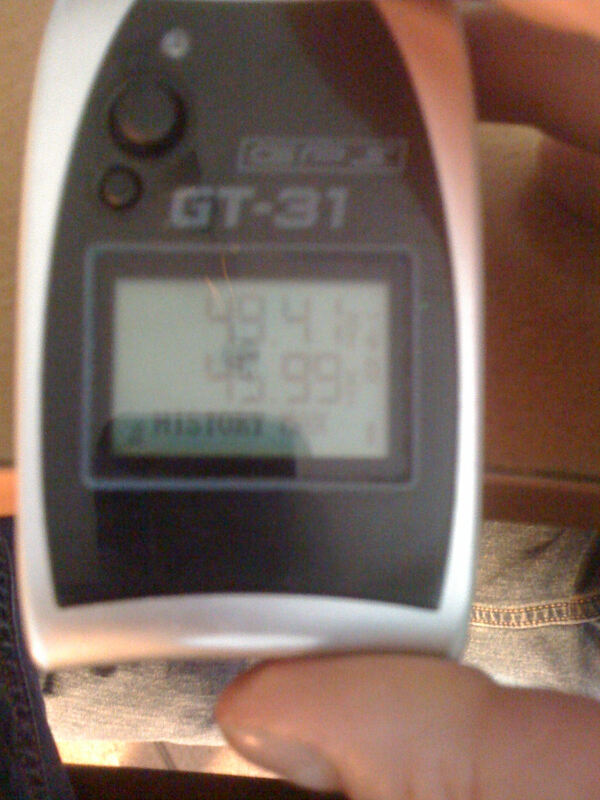 "Believe it or not sailing at 49knots isnt as scary as you would think, it's all about being in control. You can be out of control at 36knots and it's as bad." He went out on the water with his 5.5m after seeing the other 'Titans', Jacques and Steve, out on 5m sails. He rides with Black Project fins and opted to use their speed rated fins, which are not classed by length/area but by speed. They come in 35, 40, 45 sizes relating to knots not length. He chose the 40 due to the chop at the far end of the course, this has slightly more length and area so giving a touch more grip. I think they will need to rename them 45,50,55 by the time Martyn finishes with them though. Martyn had this to say about the day, and the one special run. "One run did stand out, 49.43knots maximun, 46knots 10sec on one GPS, and 49.62/46.52 on the other. I know it was fast becuase it hurt a lot when I crashed at the end of the run. Today I am back in Guernsey and taking Ibuprofen. My left hip is really hurting. Summary - It's all about learning, the board-rig-fin combo was perfect"
His next comment I really respect and have no doubt that he will go on to prove it to the world. "The board, rig and fin has been pushed to levels I dreamed about, it's all possible. This isn't what could be my fastest set up. With canal type flat water, a 44cm board, and a smaller fin I am certain I can go faster. I have an idea of the speed possible but won't publish it, I'd rather prove it." 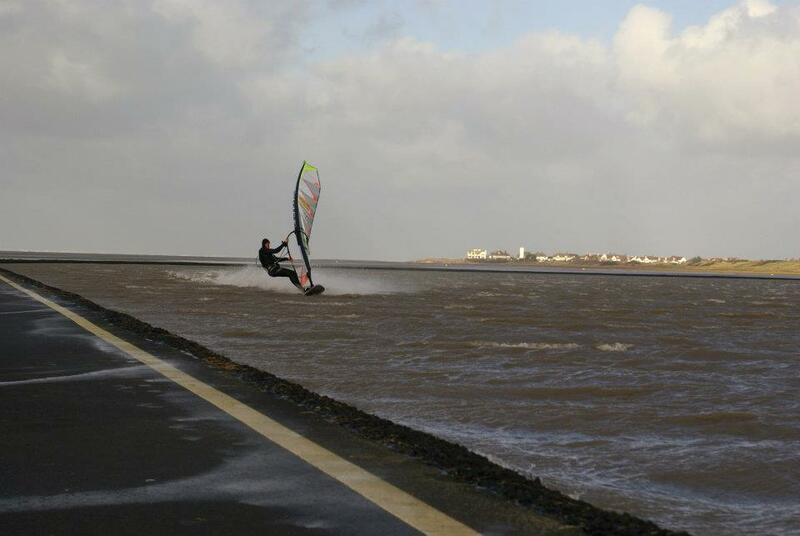 If you think thats choppy guys, come on down to Portland Harbour when its blowing over 30knots!!!! I will get the day 2 article done once everyone has posted, please be patient as I know a lot of the Titans will be travelling a long way home before even thinking about posting. There is some big news for the British contingent......some of you may know already but if not check back here tomorrow evening.